The Deep Impact was an amazing show, and there will be much more information to come. In advance of the event we set forth our expectations as explicitly as possible. Therefore, we urge readers of this page to refer to our previous Picture of the Day. We also eagerly await the first pictures of the impact site, which have not been seen due to a huge surprise: The energy of the “impact” was much greater than NASA scientists had expected and—as predicted by Wallace Thornhill—was strongly reminiscent of the early Comet Shoemaker-Levy 9 impact events at Jupiter. Indeed, the luminous glow that persisted occluded the impact site to a degree that shocked observers and will make it difficult to determine the size of the resulting crater through the glare. Of course, a prime aim of the experiment was to observe the crater before the spacecraft had moved out of the required position. So here we see another example of the potential cost of asking the wrong questions. It will be useful for independent researchers to contrast the NASA animation of the expected event with the actual event. You will observe in the animation a dark cloud of shrapnel emanating upward from a crater formed by the impact. The shrapnel is illuminated by the Sun. In the real event (see the series of images behind this TPOD) we see an exceedingly bright flare-up (left image above) with bright rays. The formation of evenly spaced bright discharge rays or filaments is characteristic of a “plasma gun” type discharge as seen on Jupiter’s moon, Io. 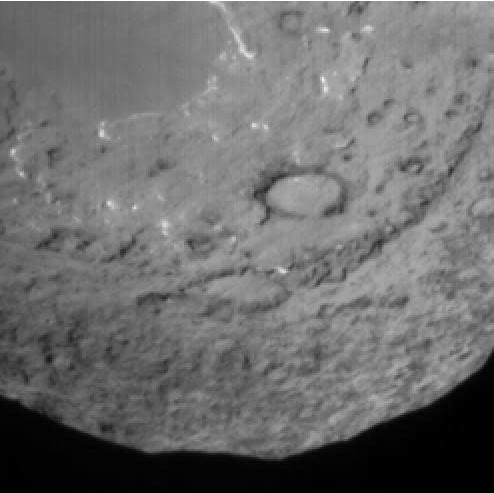 But more intriguing are the rays above the presumed main crater, which seem to emanate from a separate bright center. It indicates the sudden, simultaneous flare-up of another jet. Such an electrical effect was predicted in our previous TPOD. We noted in our prior piece that standard comet theory had fragmented into competing “explanations” of things that are virtually impossible to reconcile with the original idea of the “dirty snowball. When astronomers observed comets exploding or disintegrating millions of miles from the Sun (as in the demise of comet Linear), they began to grasp for extraordinary ways to rescue comet science from the apparent contradictions. It was inconceivable that warming from the Sun could cause a chunk of sublimating ice miles wide to explode. So we saw resorts to “fluff-ball” comets, or “sponges”, or loose aggregation of lesser ice cubes or cometesimals. But with a single impact, these "back-up" models also crashed and burned. They were no longer tenable, stated the NASA scientists. It is now our job, and the job of other critics, to remind NASA officials that there was a reason for the ad hoc proposals after the explosive demise of Linear and other comets. For a year or two these proposals verged on a majority opinion due to the extremity of the contradictions. Now, the extreme "models" are gone, but the facts that provoked them remain and must not be ignored. How many NASA scientists predicted the surface features with the clarity of the prediction we registered in our July 4 submission? On seeing the remarkable, sharply sculpted features, NASA officials used much the same language we've used in describing electrical discharge sculpting of cometary and other surface--extensive craters, flat-floored valleys, mesas, ridges. (We've inserted a larger picture of the imminent impact site here) As usual, the investigators do not know whether to call the craters impact sites or vents. They will toggle between the two as convenient. But it should not take “rocket scientists” to see that sublimating dirty snowballs don’t look like the surface of Tempel 1. The best analogy is a surface sculpted by electrical discharge machining (EDM). It looks as if the pictures will speak more emphatically than anything we could say here. The picture above right appears to show, with surprising resolution, the predicted plasma discharge tufts which we have already identified on Jupiter’s moon Io and on the surface of Mars (the towering “dust devils” of Mars). 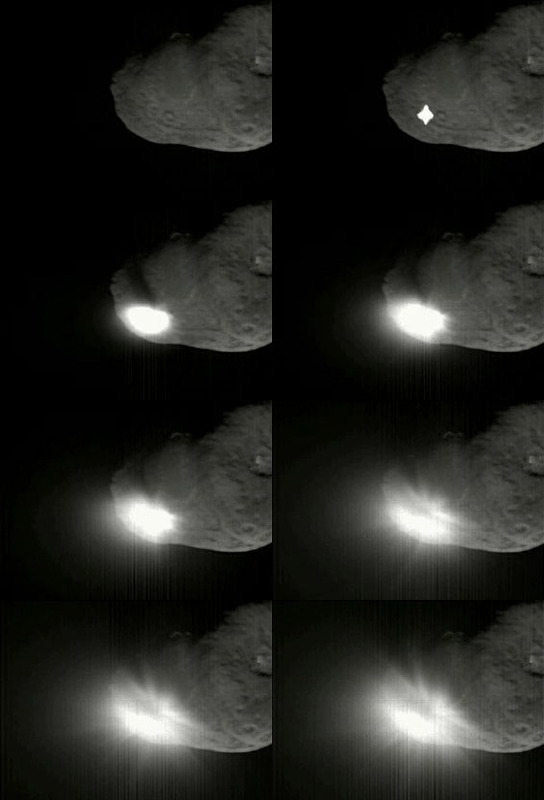 For the electrical theorists, this picture is worth more than an encyclopedia of archaic comet facts. We will be following with great interest the published spectra, light and X-ray curves and spectroscopic analysis of the ejecta from the impact. No one knows yet whether NASA will find the subsurface water that is required for the dirty snowball theory. Of course water in the coma is expected in the electric model due to negative oxygen from the nucleus exchanging charge with positive ions from the Sun. Most electrical theorists doubt the existence of extensive subsurface water. The bone-dry surface of Borrelly was a pretty good clue as to what may be most likely. And there remains for the standard model the mystery as to how dust explodes episodically from the nucleus—a mystery the specialists concede remains to be solved. The "instantaneous" brightening of the coma, larger than the Earth, is also an essential subject for us. Could distribution through the kinetics of explosion account for this? Then the coma continued to brighten to eleven times its prior brightness. These findings also echo the surprises from Comet Shoemaker-Levy 9’s encounter with Jupiter. We live in an electrified solar system.